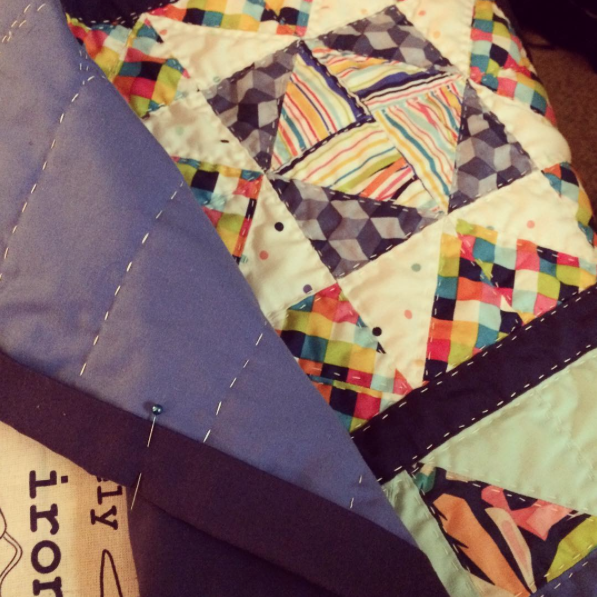 So, this weekend, I finished my fourth quilt. It's a baby quilt, and it's a little irregular, but I enjoyed the experience, and I suppose that's all that matters. Well, that and the fact that it does its purpose as a blanket. It is warm. Now, as for the title of today's post. There are a few things I've been meaning to tell you. Before we get started, this is not a sponsored post. These aren't nearly as healthy for you as the Protein Blends, but they're really very good. I think the Mediterranean-Inspired blend and the Moroccan-Inspired blend are the best ones. Bonus: They're actually really nice-looking in the bowl once they're cooked. I really hesitate to post this information for a number of reasons. Firstly, I love the Girl Scouts. I was a Brownie, and I loved it. Secondly, I'm afraid Walgreens will stop making these cookies if they're caught. However, in the absence of a Girl Scout Cookie stand, these really will do in a pinch. Walgreens' store brand cookies, Nice!, has created very acceptable knock-offs of Samoas, Tagalongs, and Thin Mints. I don't know how they're getting away with it, but they are. I've tried the Samoas and the Tagalongs, and they're both very good. Perhaps not quite as good as the original, but they will certainly do in a pinch. So, when I designed socks, one of my favorite lines to research for "inspiration" (wink wink) was Happy Socks. Well, yesterday I made a trip to Walmart, and I discovered that Happy Socks has a very affordably-priced line there called Happy Style. Photos aren't available on the Walmart website, sadly, but there's gotta be something else at Walmart you need anyway, right? That's what I thought. You probably already know about this show, but if you don't, you need to go to your Netflix Account right now and check it out. This show is great. It makes me hungry, but it also makes me feel oddly creative. All right. That's enough for your Monday morning. Grab some coffee, and make it through. Happy Monday!